If you are looking for unique features in your Fishfinder, the Humminbird HD SI Internal GPS/Sonar Combo Fishfinder with Side Imaging is a considerable option, but if you need temperature sensor, then it is not a right choice. It also has an exquisite design with GPS and great Sonar options. Humminbird is a fishfinder brand which offers some of the best fishfinders in the market. Fishfinders by Humminbird are based on latest technology equipped with all the possible features. The Humminbird HD SI Internal GPS/Sonar Combo Fishfinder with Side Imaging is one of the best fishfinders from the list of Humminbird tools. Well, there is a backlight along with this fishfinder in order to illuminate the back area for clear vision. Most of the users of fish finder are tired with the wastage of time while removing the mounting system from the fish finder. Quick Disconnect option is also available which allow you to remove your Mounting system quickly. 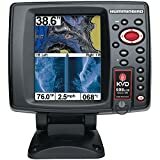 Along with decent look, this Humminbird HD SI combo fish finder which features an Internal GPS/Sonar and Side Imaging is remarkable in terms of its display screen. There is 5 inches display screen in this fishfinder which is HD. So that you can view the images in the best possible way. 256 color display is there in this display screen so that you can notice each of the detail of the sea life. There is a unique feature of down imaging sonar and side imaging sonar. The side imaging features give you a 180 degrees perspective of what lies below your boat which is side by side. While down imaging feature of the fishfinder allow you to have a fish eye’s view of the sea life. On the head unit, there is GPS antenna which identifies the location. Like every other fishfinder by Humminbird, there is an upgradable software in this tool as well. For enhancing the performance of your fishfinder, you will need to upgrade the software. There is a SwitchFire sonar in the 409470-1 600 which tells you how your sonar returns will appear on the screen. There are two modes for viewing; Clear mode and Max mode. Dual Beam Plus sonar is another remarkable feature of this fishfinder. There are two beams that give you wide area coverage along with the much-detailed view. You can use the narrow beam in order to increase the accuracy while you can use the wide beam for increasing the search area. A single SD slot is available for saving your recordings and screenshots. You can easily follow its menu and can make changes in it. All the frequently used buttons are given on top of the screen which makes it easy to get access to those buttons. No matter few people faced issues in terms of targeting the fish but other features make it a worthy fish finder.